IF YOUR MOM SAYS TO GET READY TO PLAY AT THE BEACH, SHE'S NOT TALKING ABOUT A PIANO. SHE MEANS A FRISBEE OR A SHOVEL. IF YOU ROLL OUT THE PIANO ANYWAY, SHE'LL TELL YOU, "YOU BETTER NOT LOSE IT!" Get a grip, Mom. How could you possibly lose a full-sized upright piano? What could possibly go wrong? Magnolia even promises to push the piano down the walkway herself, so Mom packs up the usual beach gear--umbrella, blanket, snacks, shovels and pails--in the red wagon, pops the baby in the stroller, and heads off toward the beach. It's a sweaty trek, but with her instrument of choice at last on the sand, Magnolia serenades her family with beach music down by the sea. The trouble begins when Maggie decides to eat her egg-and-cheese sandwich on top of her piano and is joined by a flock of uninvited seagulls who join her for lunch. They drape the piano with sandy seaweed and proceed to decorate it with their distinctive black-and-white, er, droppings! THIS, YOU WILL SAY, IS NOT GOOD FOR THE PIANO. BUT YOU'LL KNOW JUST WHAT TO DO. THE PIANO WILL BOB UP AND DOWN. 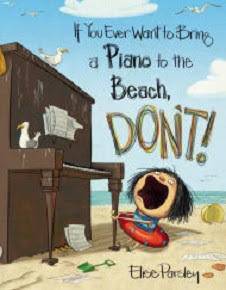 Time and (especially) tide wait for no one, as the stubborn Magnolia finds out, in Elise Parsley's companion book to her New York Times best-seller, If You Ever Want to Bring an Alligator to School, Don't!, her just-published If You Ever Want to Bring a Piano to the Beach, Don't! (Little, Brown and Company, 2016). As Ben Franklin might have observed, "Experience keeps a dear school, but Magnolia will learn in no other." As the sun sets in the west and on the horizon her piano floats out to sea, Magnolia wishes she'd given her plan a little more thought. Maybe a Frisbee or a shovel would have been a better choice. Paisley's opinionated protagonist again provides a comic cautionary tale as, she learns that just because she can do something doesn't mean that she should. Paisley's illustrations tell the tale all too well, as her swarms of seagulls and the salty waves have their way with Magnolia's beloved piano. Will our heroine ever learn to curb her enthusiasm? To be continued.